Come and visit Gellert Spa at Easter. Easter Sunday and Easter Monday are public holidays in Hungary. 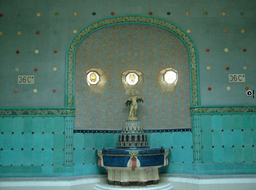 At Easter Gellert Spa will be open all day, and the prices of bath tickets will be set as weekend prices. The prices of bath entries will be the somewhat more expensive weekend prices in Gellert Spa. In case you are interested in having a massage therapy on Easter Sunday or on Easter Monday, we recommend to book your treatment online in advance, as most massage hours are sold out a few weeks before the Easter Holidays. Private bath: The Gellert Spa Private Bath will probably be very busy as well during Easter. In case you are interested in other spring events around Easter, check the things to do in Budapest in March. or the things to do in Budapest in April.